The Sharp HT-SB602 ($400, 4.5 stars) is a bruiser of a sound bar. A huge 55 inches in width, the soundbar is immediately striking thanks to its lack of a grille covering the drivers. All six drivers are exposed, giving the speaker an industrial look. Even the side-firing wireless subwoofer is designed with the bass reflex port facing forward, not to the rear, in order to up the ultra-modern look and feel of the system. A helpful LED up front tells you exactly what source you’re listening to and what the volume is, sparing you from having to decode random LED patterns. Whether that fits in with your living room’s design motif or not, the audio pumped out by the HT-SB602 undoubtedly will. Although it’s just a 2.1 channel system, it packs 310 watts of power (150 watts to the sub), and it sounds like even more. From gaming to movie effects to music, the Sharp HT-SB602 provided the richest, most immersive audio and overall simply sounded the most accurate and true to life of all the units I tested. Naturally there are going to be some limits when you’re dealing with drivers this small, but Sharp makes the most of them, managing to coax soaring highs and rumbling lows out of the system. Having such a wide soundbar helps, as the speaker placement naturally builds a more immersive sound field. The HT-SB602 features two HDMI inputs (one cable is included) and an HDMI output for your TV, optical audio input, and a 3.5mm input jack. Bluetooth is supported, as are NFC connections. 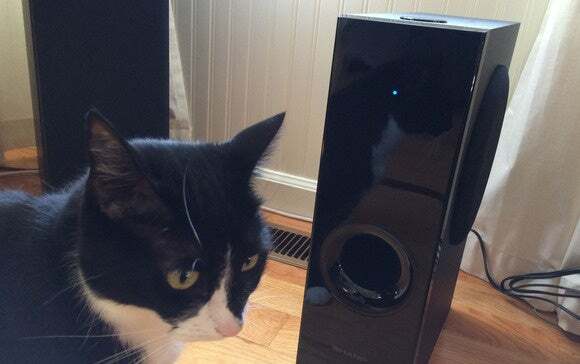 (The NFC reader is located on top of the subwoofer, not the soundbar.) You’ll also find in the box an IR blaster to help alleviate any trouble with blocked IR ports on your television. Only the lack of analog RCA jacks is likely to cause anyone trouble during setup. Dolby Digital and DTS decoding are supported, but not Dolby TrueHD or DTS-HD Master Audio (important for soundtracks you’ll find on Blu-ray discs). If there’s any downside to the HT-SB602, it’s the remote control. With more than 40 buttons, this monstrosity looks like it’s designed to launch Scud missiles, not control a couple of speakers. Some of this feels like it has to be a joke: Among the seven sound-field modes, do we really need a “News” setting? And hopefully you know your ARC button from your APC button. Tragically, the user manual—printed on one side of a huge sheet of newsprint and folded up into a square—is functionally useless. That’s ultimately a minor concern. The HT-SB602 is otherwise intuitive, easy to figure out, and works great right out of the box. Just program the volume and input buttons into another remote and stash this one away. Your ears will thank you. This bruiser of a sound bar delivers best-in-class audio performance and features. It's a terrific value.